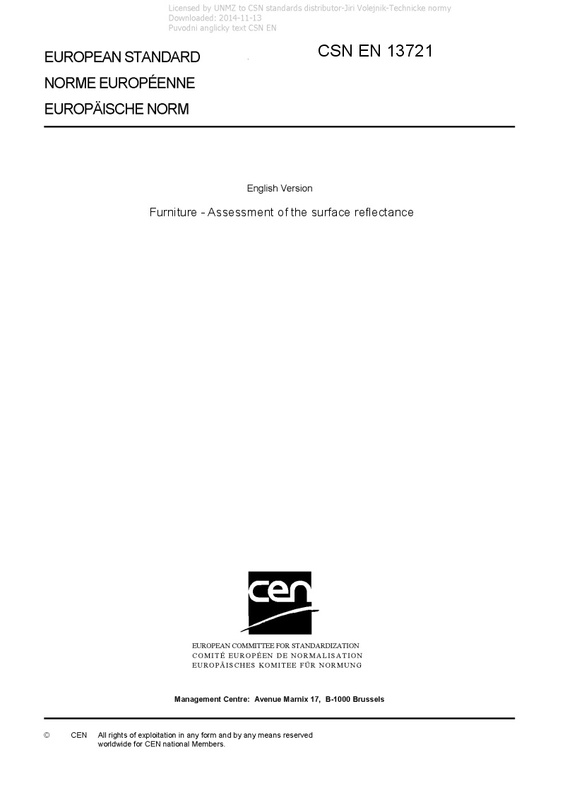 EN 13721 Furniture - Assessment of the surface reflectance - This document specifies a method for the assessment of the surface reflectance of furniture surfaces and relates to rigid surfaces of all finished products regardless of materials, except for finishes on leather and fabrics, which are excluded from this document. The test is intended to be carried out on finished furniture, but can be carried out on test panels of the same material, finished in an identical manner to the finished product, and of a size sufficient to meet the requirements of the test. The test method does not apply to extreme reflectances, i.e. below 15 % and above 75 %, because in the extreme reflectance range the results of the different measurement methods could deviate. It is not applicable to some metallic paints and pearly coatings.